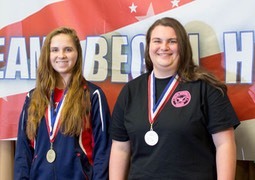 USA Shooting has announced on FaceBook that Carrie and Clarissa Haltiwanger have been invited to the Olympic Training Center in Colorado Springs to compete in the 2019 National Junior Olympic Shooting Championships Apr 21-28 - Carrie in Women's Air Pistol and Women's Sport Pistol, and Clarissa in Women's Air Pistol. Three members of the Citadel Pistol Team will compete in the men's events. The Mid-Carolina Gun Club has requested and received permission of Gun Owners of South Carolina to hold the 2019 State Outdoor Precision Pistol Championship on 6/21/2019 to 6/23/19 . Palmetto State Marksmen Association has requested and received permission of Gun Owners of South Carolina to hold the SC Long-Range State Championship on 10/26/2019 to 10/27/2019 on Range 4 at Fort Gordon, Ga.
Due to the scam listed below if you need to email any officer or Board member please send to GOSCmembership@gmail.com and it will be forwarded. Thanks and sorry for the inconvenience while we work on this matter with Law Enforcement. Please beware of a SCAM EMAIL being sent to all Officers of GOSC from the President requesting you purchase iTunes cards (5 at $100 each) and that you will be reimbursed. This is nothing more than a SCAM like other scams that are going. The President of GOSC nor the organization would not request funds, especially through iTunes cards, “rush” money, etc. Currently the email going around is addressed to Officers of GOSC, but others may receive them as well. The email is showing it was sent from the GOSC President’s iPhone, which he does not possess. These incidents have been reported to Law Enforcement. Should you receive any email requesting money from GOSC or the President, DO NOT accept, please delete it and do not click on any links that are in the email! Two local sisters joined about 200 other pistol shooters in Colorado Springs, Colorado for the US Junior Olympic Pistol Championship April 20-24, 2018. 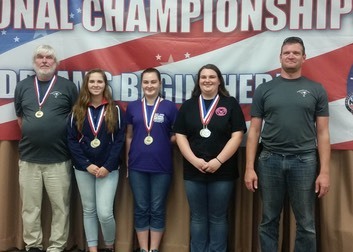 Carrie Haltiwanger and Clarissa Haltiwanger of the Newberry Junior Pistol Club earned invitations to compete by putting forth outstanding performances at the SC State Junior Olympic Championship back last December. Only the best qualifiers from all over the country are invited to compete at the US National Junior Olympics. This was Clarissa's first trip to US National Junior Olympic Championship and she turned in an outstanding performance. She was able to capture a Silver Medal in her age category, 14 and under, and finished 10th overall in 22 cal. 25 meter sport pistol. She also finished 10th in her age category in 10 meter air pistol. Her sister Carrie is a two time Bronze Medalist from previous years and did very well this year also. She was able to capture 17th place in 25m sport pistol and 16th in 10m air pistol. The 16th place finish in the air pistol competition does not truly represent how well she shot during the 2 day competition. After day one she was in 3rd place. But on day 2, she had a problem with time and was unable to get off her final 3 shots and dropped to 16th. These girls were competing with the best shooters, age 20 and under, in the country. They were accompanied by their coach Ben Blanton. He was very proud of their performances and achievements. 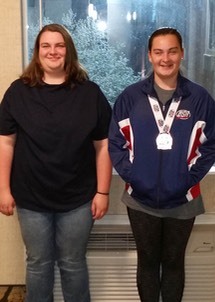 Carrie and Clarissa along with their teammate Taylor Martin also won the mixed team Gold Medals at the 2017 US Junior Olympic National Progressive Positional Pistol Championship. The Newberry Junior Pistol Club is open to youths of all ages. Anyone interested in participating or helping out either physically or financially can contact Head Coach Ben Blanton at 803-924-4694. The club is funded by grants from the NRA Foundation, Gun Owners of SC, and the Midway USA Foundation. Stokes Trainor and Kiswire also made donation to assist with the expenses. Thanks to everyone for their support. SC Attorney General’s Opinion in reference to Greenville City Ordinance Sec. 24-264 in reference to possession of loaded rifle or shotgun on public property. Click the link below to view the opinion. 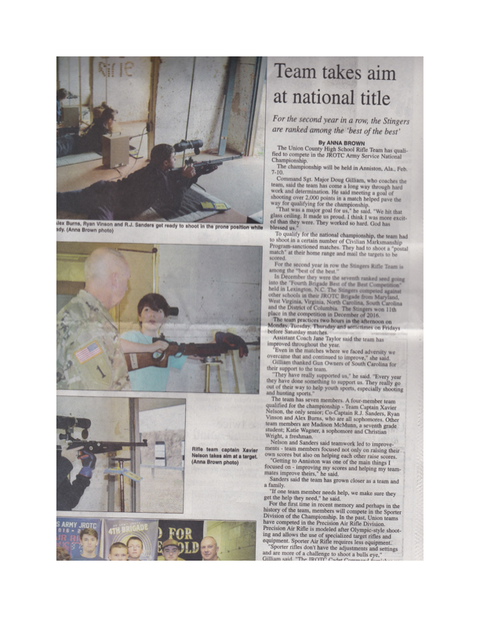 Union County High School Rifle Team Qualified to Compete in the JROTC Army Service National Championship. Please check your membership card and renew if needed. You can find the forms in the members section of this webpage. If you have misplaced your card or not sure of the expiration date and if your address or email address has changed please email GOSCmembership@gmail.com . The GOSC Annual Meeting will be held on November 19, 2017. Post cards will be mailed out to members. Please see information below. We are in the process of setting a date for the annual meeting. Please check back periodically for more information. We are currently trying to update our software and working on a technical problem with hardware. 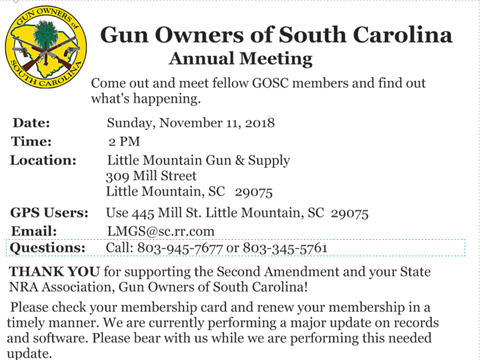 If you are joining or renewing your membership please send the form listed in the membership header above, print out form, fill out and mail to GOSC Post Office Box 326 Prosperity, SC 29127 with your payment. (Please note this will be a temporary address change but we will try to process your request in a timely manner. At some point when the technical issues have been resolved we will put up another notice for the new mailing address. If you have any questions please email GOSCmembership@gmail.com and we will try to help assist you. If you have already sent the form with your payment and waiting for your membership card please give us a week while we are working on these problems. If you have not received your card please send a friendly reminder so we can research and rectify the problem quickly. Thanks for your assistance and patience while we are working through this process to update, streamline the workflow. Local shooters from the Newberry Junior Pistol Club traveled to Anniston Al the first weekend of August for the US Junior Olympic P P P Pistol Championship and the NRA National Air Gun Championship. 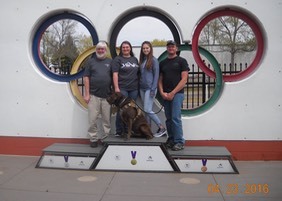 The three day competition was a dual venue competition with the east coast competitors shooting in Anniston Al and the west coast competitors shooting at the Olympic Training Center in Colorado Springs Colorado. Regional and National Champions were declared. The team from Newberry included Carrie Haltiwanger, Taylor Martin and Clarrissa Haltiwanger. They represented a mixed team with Carrie and Taylor shooting international standing and Clarrissa shooting basic supported. The team turned in an outstanding 2 day total of 2171 points , winning the Regional and National Gold Medals for the mixed teams category. The second and third place teams scored 2083 points and 1943 points respectively. Carrie was able to take gold in the regional individual championship with Taylor right behind her taking silver. Only 3 points separated the two going into the finals. On the national level Carrie took individual bronze with Taylor finishing 4th. Clarrissa was able to win Silver in the individual regional basic supported championship and Bronze in the national individual championship. 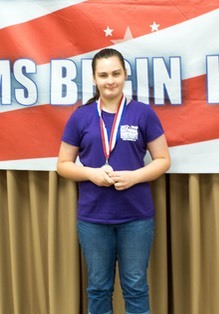 Clarrissa was also named Sub Junior Regional Champion at the NRA Air Gun championship that followed the US Junior Olympic PPP Championship. 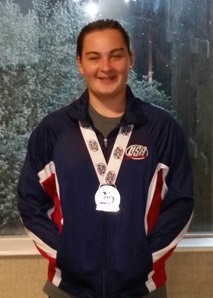 This outstanding performance is a follow up of the great shooting that Carrie and Taylor accomplished at the US National Junior Olympic Competition back in April where Carrie won Bronze in international air pistol and finished a strong 4th in 22 cal sport pistol , only 2 points out of a medal. Talor was able to finish a strong 5th, only 2 points behind Carrie in sport pistol and a great 8th place finish in air pistol. Coaches Ben Blanton and Shawn Martin are very proud of the girls and their outstanding performances. Anyone interested in participating with or supporting The Newberry Junior Pistol Club can contact us through our Facebook page or call Head Coach Ben Blanton at 803-924-4694. Please be advised, if you have renewed or just joined GOSC and have not received your membership card we are having difficulty with a local post office with mail being put in the outside box. Several personal letters along with GOSC mail has been lost and never delivered. If you have joined or renewed in the last several months and have not received your new card and patch, please e-mail the President of GOSC and give him the information such as your membership number and approximately when you mailed it and when your check was deposited in the GOSC account. If you renewed, your number will remain the same, and a new card will be issued along with your patch. New members will be issued a card and patch. We have contacted the Postal Service regarding this problem and are awaiting a reply from them. Also, we have received calls from members stating that GOSC was not listed as a member of CMP. If you are searching for our membership, we are not listed in the regular listings. We are listed in the State Associations and we are currently a member and have already renewed for next year. Please check out Herb’s Notes, he has a lot of information on 2017 NRA Bylaw Amenments, the 2017 NRA Annual Meeting & Exhibit in Atlanta, the loss of a legend and FONRA 25th anniversary! It is with heavy heart that the Gun Owners of SC is informing it’s members of a great loss. Patricia “Patty” Clark, who is a member of GOSC and a very instrumental part of the association was involved in a vehicle accident and passed away. Patty worked with the Women’s program and travelled the state promoting gun safety. For more information please click here . Please keep her and her family in your prayers. Gun Owners of South Carolina was founded in 1978, formerly the "South Carolina Shooting Association". Gun Owners of South Carolina is dedicated to the protection and promotion of the law-abiding citizen's constitutionally guaranteed right to own, bear and use firearms for hunting, target shooting, protection of family, self and home, collecting and all other lawful purposes. GOSC is also dedicated to bringing all shooters, especially young shooters to the sport and give them an appreciation of our Second Amendment Rights. Gun Owners of South Carolina is affliated with the National Rifle Association. GOSC encourges all members to join both associations.